Pezzottaite is pink to raspberry in color and and it was at first thought that this material was red beryl or a morganite containing cesium. But some differences became apparent on analysis. Pezzottaite also contains lithium (which beryl does not), and it forms in the trigonal crystal system unlike beryls which form hexagonal crystals. While Pezzottaite has the same hardness as beryl -- 8 on the Mohs scale -- its specific gravity and refractive index are both higher than beryl. Because of these unique properties, Pezzottaite was recognized as a distinct variety by the International Mineralogical Association in 2003. It was named in honor of the Italian mineralogist, Federico Pezzotta, for his work on the granitic pegmatites of Madagascar. Pezzota is currently curator of mineralogy at the Museo Civico di Storia Naturale in Milan. Gemologically, Pezzottaite has a density of 2.90-3.10, compared to 2.68-2.74 for beryl. It has a refractive index of 1.601-1.620 compared to 1.565-1.602 for beryl. Like red beryl and morganite, the color of Pezzottaite is thought to be due to colour centres involving trivalent manganese that are modified by natural radiation. The Madagascar Pezzottaite deposit is now believed to be exhausted. Since then another deposit was found in Afghanistan. The Afghani material was first believed to be morganite, the light pink form of beryl. But subsequent analysis showed it to be Pezzottaite. Since Pezzottaite is so rare, it is mainly a collector's gem. 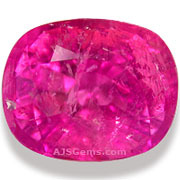 Most specimens are well under 1 carat and are cut as cabochons due to their many inclusions. Facetable material is unusual and larger specimens are quite valuable. We bought some of this material when it was first discovered and were able to cut a 7.89 ct faceted stone in an intense hot pink that is one of the finest examples of Pezzottaite we've seen. 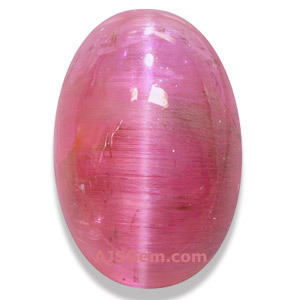 Some of the included material displays a cat's eye when fashioned as a cabochon. All of the Pezzottaite we have seen is completely untreated. Both red beryl and Pezzottaite count as exceptionally rare gems. But red beryl has proven to be the more valuable of the two thus far, probably because of its more saturated color. We are aware that some specimens of pezzottaite have been offered on the market as red beryl, perhaps out of ignorance or possibly with a fraudulent motive. Buyers of red beryl should take care that offered gems are certified by a recognized gemological laboratory. Expensive Pezzottaite specimens should also be certified to avoid confusion with the much less expensive morganite.